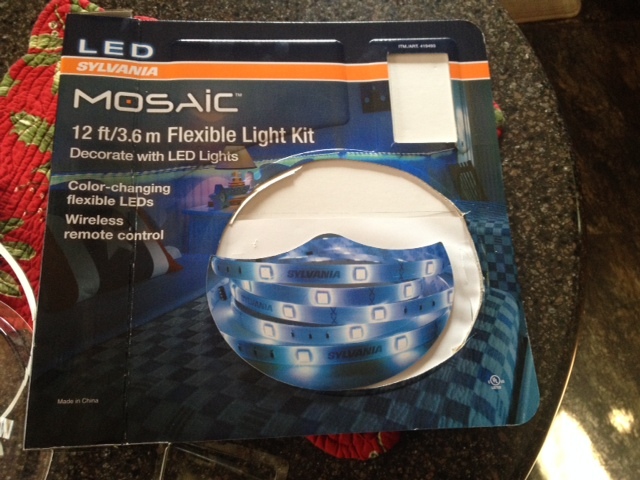 We picked up a flexible LED light strip kit from Costco (for $30). 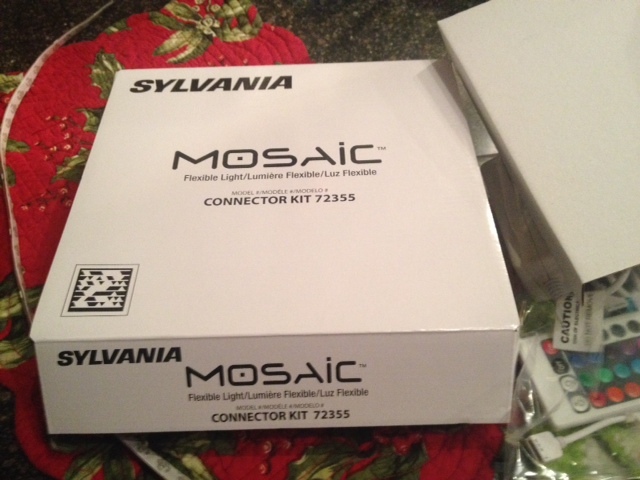 After doing some figuring, Malcolm ordered a set of wiring connectors from Amazon (for $18) and had them shipped in. 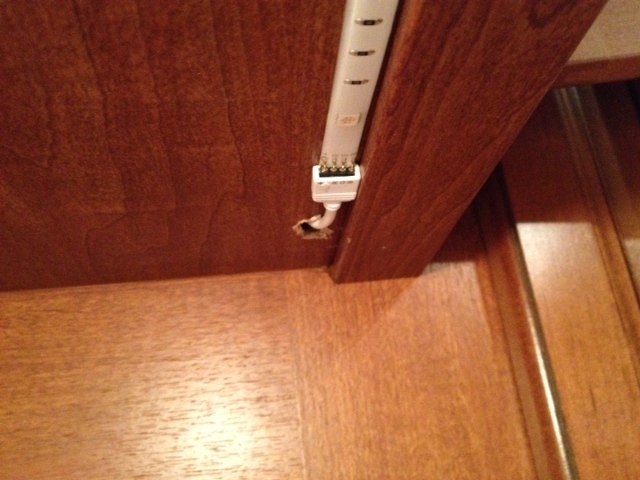 Once those connectors came in, Malcolm installed our light strips under the kitchen cabinets. 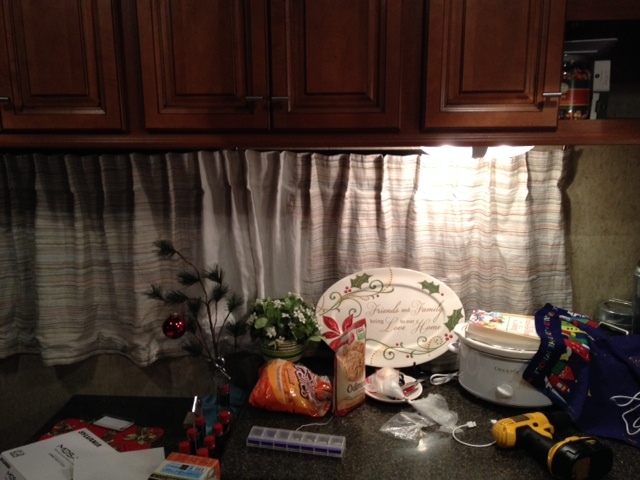 The first step was to mount the light strips under the front edge of the cabinets. We had six strips. 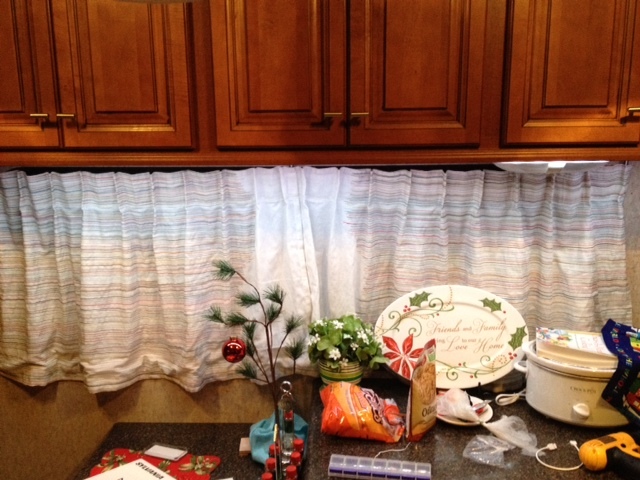 Three went under the long cabinet on the side of the kitchen, and one each went under the three cabinets at the back of the kitchen. 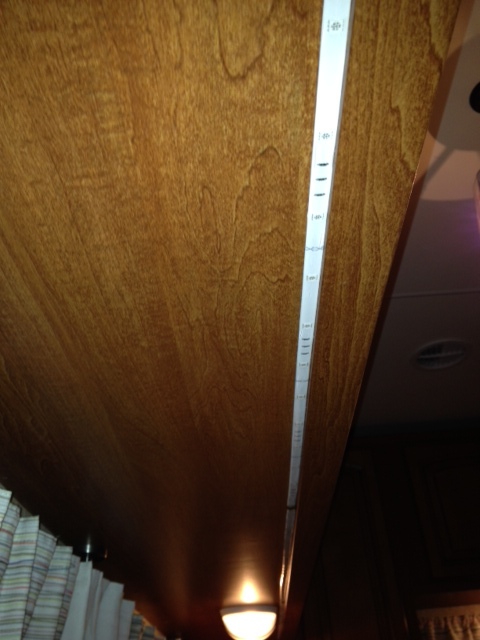 Three strips under long cabinet. Malcolm drilled holes through the cabinet bottoms for the various connectors. Then he poked the connectors through the holes. Then the connectors were connected to the strips. This continued on for all the various light strips. 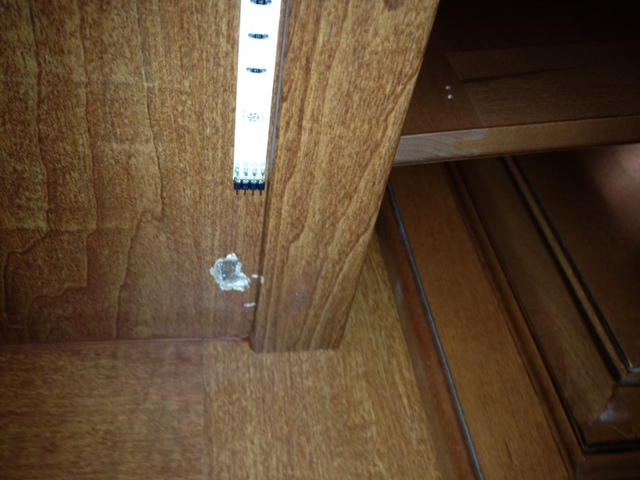 Here is a before and after test just for the long cabinet. 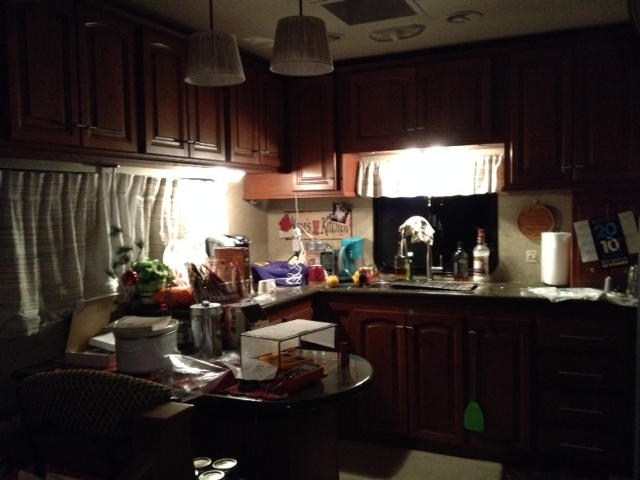 With all the light strips in place, Malcolm removed the two pancake light fixtures from under the cabinets. 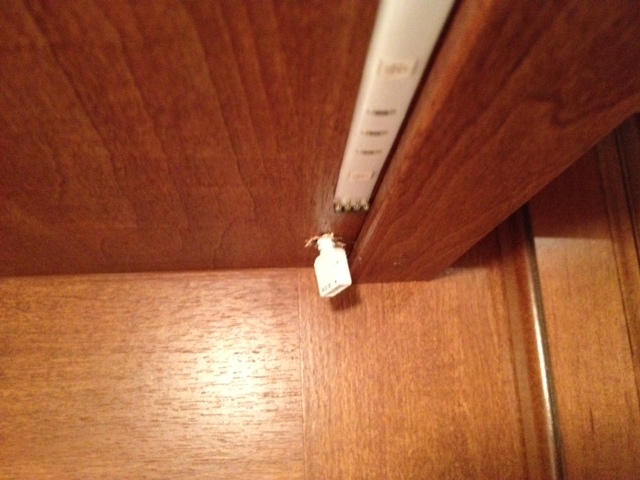 The wiring from the long cabinet fixture was pulled back into the adjacent cabinet. Malcolm cut the end off the 120V adapter supplied with the light kit and connected it to the wires from the old light. The light kit had a 12V adapter, so we could run the control box directly off the 12V wiring from the old lights (and retain the wall switch). 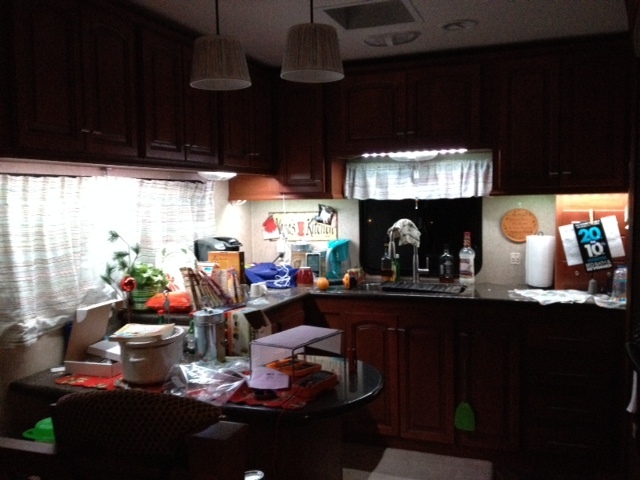 Before removing the old lights, Malcolm did a full before and after test with all the other lights turned off. Note that the far right-hand side of the counter is now very well lit, where it used to be in the dark. Malcolm removed the old fixtures and tidied up all the wiring. 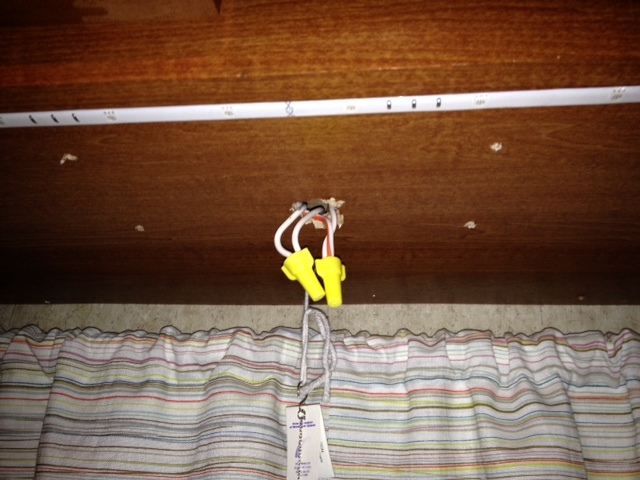 Wiring from over-sink fixture, pushed up into hole. 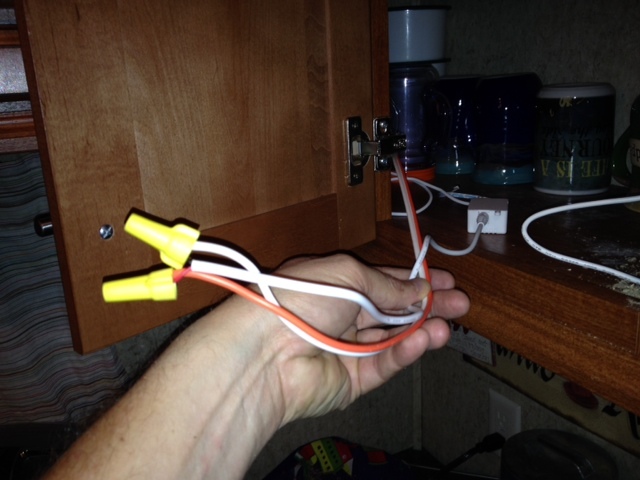 Wiring from other fixture, connected to control box. Malcolm tucked the control box back in the cabinet where we keep our coffee mugs. There was a remote control supplied with the unit that is an infrared control. The control box had a small pickup that Malcolm poked through one of the holes and discretely mounted under one of the cabinet bottoms. Now we can have many colors of lights and can dim or brighten them as desired.